a breed of dairy cattle. 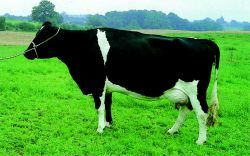 See holstein-friesian. Dutch light horse used for driving and riding. Black with no markings, 15 hands high. A muscular horse with feather on the lower limbs. The afternoon began with a champagne reception in the French country manor house's Chateau, followed by an Old West extravaganza that had the group costumed in western apparel for a buckboard ride down to the Stonepine Corral where they experienced a unique western show with rare Andalusian and Friesian horses, a chuck wagon BBQ and line-dancing in the authentic Stonepine Saloon. Her coffin was brought to the church in a hearse drawn by two Friesian horses, while a second hearse carried the wreaths. Santa has switched his traditional mode of transport for a green Victoria carriage pulled by a pair of black Friesian horses when he arrives at Peter Barratt's Gosforth Park Garden Centre, Newcastle, on Saturday, December 5, at 11am. It was followed by a Victorian-style carriage containing the 27-year-old's coffin, which was drawn by four specially-trained black Friesian horses wearing black ostrich feather headdresses. Billy's close family, his wife Hannah, son Billy Jay and daughter Baccara followed in the second, drawn by Friesian horses. I would like to express my sincere appreciation for the coverage reporter Mark Baker provided on the recent showing of Friesian horses (Register-Guard, Sept.
actually features a herd of grand Asian elephants, as well as Bengal tigers, Arabian and Friesian horses and zebras. CORRECTION (ran 9/20/02): Friesian horses judged Wednesday at the Oregon Horse Center in north Eugene were evaluated on their walking, trotting and "conformation," the shape or outline of the horses.